This Father's Day, share something vitally important with the men who matter to you: knowledge that could help them stay healthy. 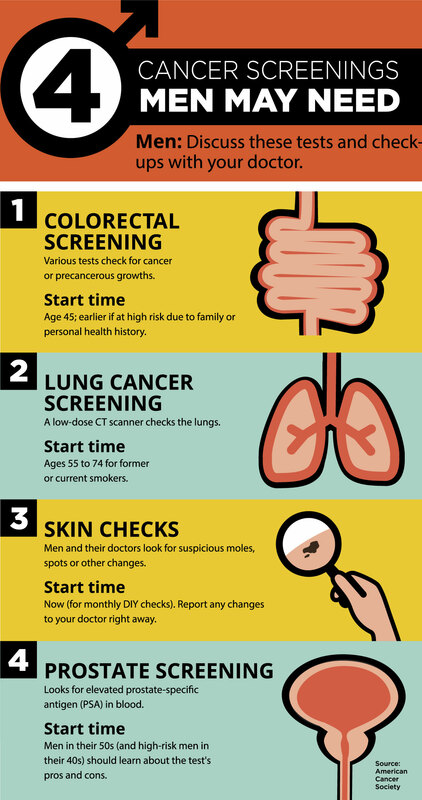 Encourage the dads in your life to take a peek at this cancer screening advice from the American Cancer Society. Men: Discuss these tests and checkups with your doctor. Various tests check for cancer or precancerous growths. Start time: Age 50; earlier if at high risk due to family or personal health history. A low-dose CT scanner checks the lungs. Start time: Ages 55 to 74 for former or current smokers. Men and their doctors look for suspicious moles, spots or other changes. Start time: Now (for monthly DIY checks). Report any changes to your doctor right away. Looks for elevated prostate-specific antigen (PSA) in blood. Start time: Men in their 50s (and high-risk men in their 40s) should learn about the test's pros and cons. Could excess body weight boost your cancer risk? Find out by taking this quick quiz. It will help you separate fact from fiction when it comes to cancer protection.